Alfred by Fermob is a practical and universal side table in a modern design. It is compact but extremely practical thanks to the double tabletop and its rollable lower frame. Therefore, Alfred is a welcome guest not only in the kitchen, but also at the barbecue, in the garden or for dinner parties. 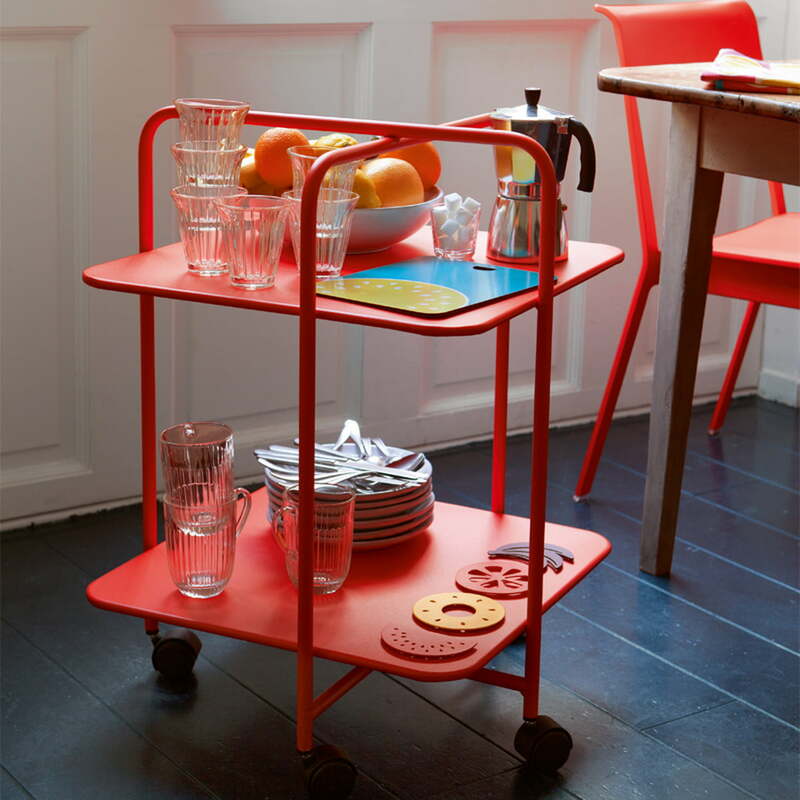 Alfred is the reincarnation of the workshop trolley and the ideal butler in a modern and colourful style. With its grip and the castors it can be transported easily and is can be used flexible in both the living room and the kitchen as well as in the garden and on the balcony. Alfred is made of steel, so that it is weather-proof and can be placed inside as well as outside. 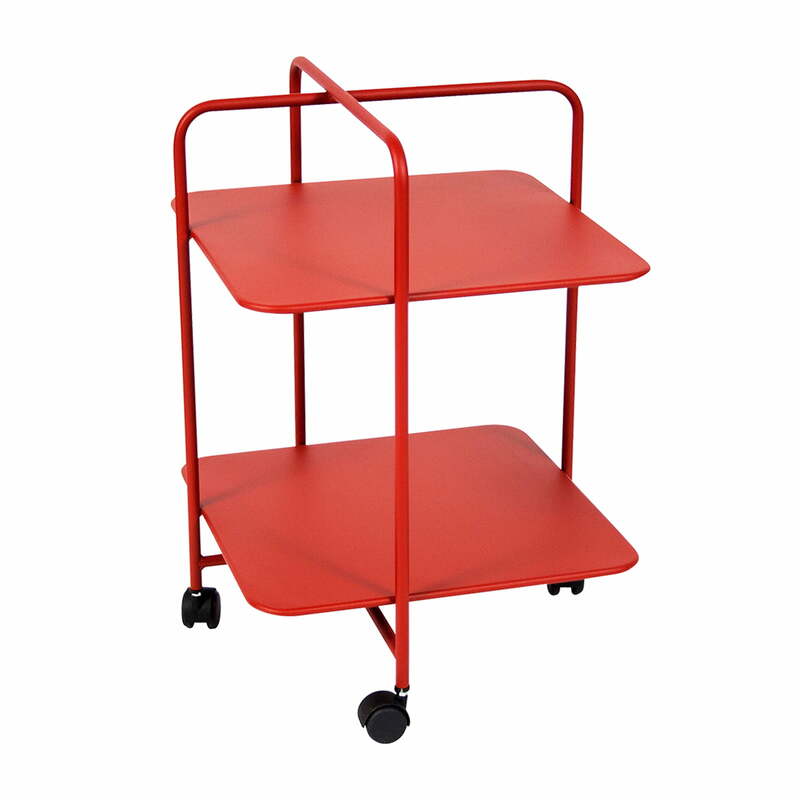 Upon request, the handy trolley is available in other Fermob colours. The furniture and home accessories by Fermob bring colour and joie de vivre in your home and especially in you expanded living area in the garden or on the balcony. 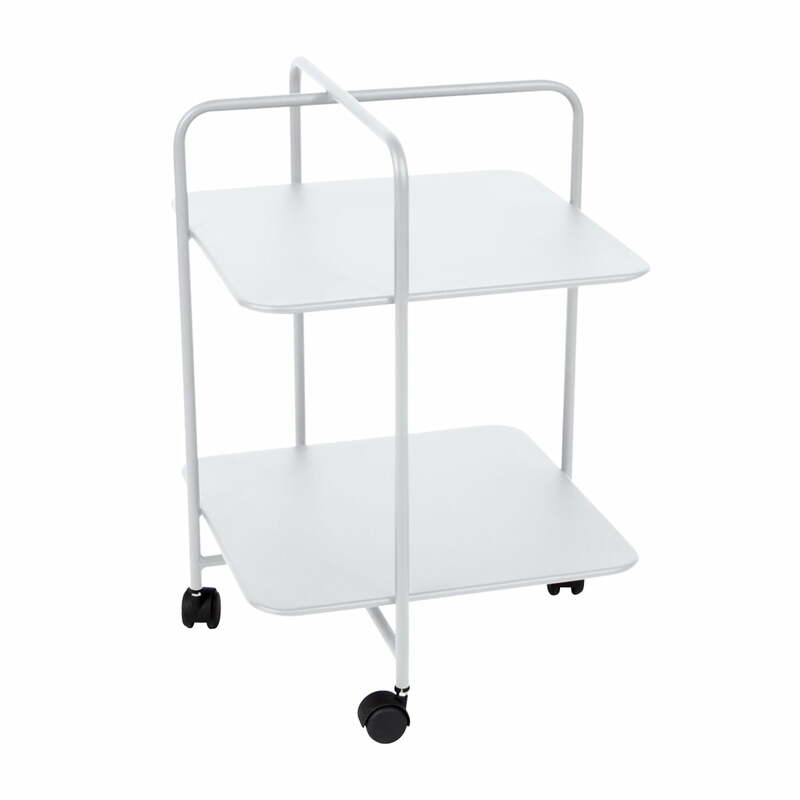 Single image of the Alfred Side Table on castors made of plastic with the frame and two shelves made of steel in cotton white by Fermob. Since Alfred is made of steel, it is weather-proof and can be placed inside as well as outside. Single image of the Alfred Side Table on castors in poppy by Fermob. The side table is suitable for both indoor and outdoor use. It is compact but extremely practical thanks to the double tabletop and its rollable lower frame. Single image of the Alfred Side Table on castors in carrot by Fermob. The design for the side table comes from the designer Pascal Mourgue for Fermob. Its appearance is extraordinary and unusual with its off-centre, asymmetrical design and the asymmetric staggered lines. The appearance of the Alfred Side Table on castors by Fermob is exceptional because of its asymmetrical staggered lines which makes him the favourite of indoor and outdoor areas.